Sometimes, there are difficulties to uninstall programs, such as antivirus, firewall, anti spyware and the like. If the software authors do not provide specific utilities, the matter is complicated. 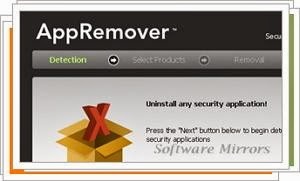 AppRemover is designed to solve the uninstall problem. AppRemover is a portable tool that detects these programs and gives you the option to completely remove them one by one or all at once. The progress bar and the text box will inform AppRemover ongoing operations. If an incident should occur, the "Report Issue" button is used to send an email to the creators of AppRemover to inform them on the spot.